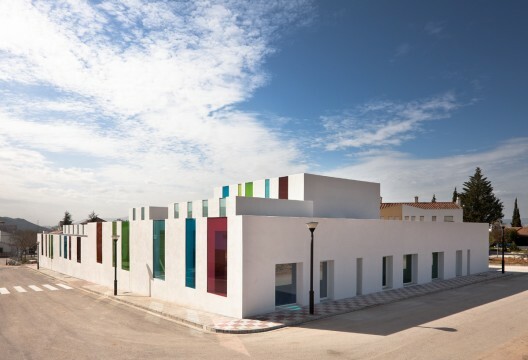 The orientation of this playful kindergarten in Granada Spain, creates a tension that is expressed through the system of apertures. Designer, Alejandro Munoz Miranda, designed the spaces opening towards the North and the courtyard get large window panels, while towards the south and the public, light is admitted only through glazed “cracks”. The fissures corresponding to the corridor and the exterior covered playground are brightly colours, while for the classrooms only clear glass is used. The classrooms are differentiated according to age groups (two classrooms for children up to1 year with bedroom, two classrooms for children from 1 to 2 years with bedroom and three classrooms for children from 2 to 3 years without bedroom). All the classrooms on the same level can be connected for larger group activities. Even if the mobile partitions are closed, visual continuity is still present through the glazed upper parts of the dividing walls.